Hundreds of these families have settled in the Lebanese border town of Arsal, a low income community whose population has more than doubled in size due to the influx of refugees. Lebanese returnees living in Arsal and its outskirts, many of whom have been there for over two years, received their first food aid package in early May. Around 200 families received food boxes prepared by Lebanese NGO Food Blessed and the group Lebanese for Syrian Refugees. The food packages, part of the first widespread aid distribution package for Arsal’s returnees in two years, were distributed to the returnees by local partner NGO Shabab lil-Umma. After displaying his Lebanese identification card, returnee Abdul Malik Hassan Ezzedine collected a cardboard box with enough nonperishable food items for roughly one hundred meals. For him and his six children, the food package will barely last five days. UNHCR, the UN agency responsible for coordinating aid to Syrian refugees in Lebanon, cannot provide aid to anyone who is a Lebanese citizen. Palestinian refugees escaping Syria turn to UNRWA, the body created specifically to address their needs in the aftermath of the Nakba. Lebanese returnees are referred to the Lebanese government’s High Relief Commission (HRC) and the International Organization for Migration (IOM). According to IOM Emergency Coordinator Angela Santucci, HRC and IOM work with various local and international NGOs to assess where returnees are located and what their needs are. IOM and HRC conducted a registration drive between July and October of last year, registering over 17,000 Lebanese returnees (approximately 3,200 households) from Syria who are in need of assistance. However in a report about the situation released in December 2013, they estimated that the true number at the time was around 29,000 individuals (roughly 5,270 households). Their expectation is that once you add the number of new arrivals to the non-registered returnees the number will have significantly grown by the end of this year. “Although we haven’t been able to get updated statistics [since October], our projection is that there will be 50,000 [returnees] by the end of 2014,” Santucci said. Most returnees registered by IOM had been living in Syria’s Homs province, with the next largest number coming from Damascus province. Fighting in Homs escalated significantly in 2012, driving both Syrians and Lebanese out of their homes. Like Syrian refugees, the largest number of Lebanese returnees settled in the Bekaa and are renting apartments or living with host families. Around 80 of the registered households live in tented settlements or collective shelters with Syrian refugees; but with so few returnee families officially registered, the number living in tented settlements is likely to be much higher. The IOM notes that the Lebanese government’s capabilities have become “severely overstretched” and that returnees’ basic access to resources must be drastically improved. “In the current context, the needs of Lebanese returnees have often been overlooked, either because they aren’t refugees or because there has been a lack of detailed information on their situation,” wrote Santucci in an IOM press release in December 2013. Though displaced by the same conflict, Syrian refugees and Lebanese returnees have had very different experiences. Unable to access UNHCR support, Lebanese returnees — especially those living in border areas like Arsal — have much less support from the Lebanese government and local and international NGOs. While registration with UNHCR for Syrian refugees in Lebanon has been continually open since 2011, IOM and HRC have suspended registration for Lebanese returnees due to budget constraints, thereby preventing people not already registered from getting access to what little assistance the agencies have available. Nor are returnees’ lives similar to disadvantaged Lebanese citizens. The national average unemployment rate hovers around 10 percent, but the unemployment rate for Lebanese returnees is an alarming 69 percent. Only 2 percent of the 9,630 returnees aged between 18 and 64 have regular employment, and nearly 30 percent of returnee families have no wage earners at all, according to a recent IOM assessment. For Ezzedine and other Lebanese returnees in Arsal’s outskirts, the only option for employment is in the town’s quarries, where 12 hours of backbreaking work earns them LL 10,000 (less than $7). In terms of employment, Lebanese returnees occupy a middle ground between refugee and citizen. While there is nothing legally preventing them from working, there simply aren’t jobs to take. This is largely due to returnees arriving in Lebanon’s border areas and the Bekaa valley, where jobs are already scarce and infrastructure is straining under the number of refugees. Rather than moving to find work, many returnees are choosing to remain close to Syria so that they can return more easily. Returnee children also face challenges in resuming their education in Lebanon. According to Santucci, although returnees’ Lebanese identification cards allow them to register with Lebanon’s state schools, they are accustomed to Syria’s Arabic-language school system and curriculum and find it very difficult to adjust to Lebanon’s French and English systems. A full 85 percent of returnees own no property at all in Lebanon. And with many returnee families having spent more than six decades in Syria, many lack a network of Lebanese relatives or friends on which to rely. While they are not classed in the same category as Syrian refugees, returnees’ stories are much the same. They arrived in Lebanon with nothing. “There are cases where these people have been living in Syria for so long — for decades — that their vulnerabilities are associated much more to Syrian refugees,” Santucci said. IOM noted in its December 2013 report that the circumstances of Lebanese returnees are closer to those of Syrian refugees — despite some differences — than to the situation of poor Lebanese. Their inability to access basic services, find employment or be accepted by other Lebanese people is also hampered by people’s perceptions. Many have Syrian accents and are seen by much of Lebanon’s population as Syrian. “When you’ve been made a refugee from a country where your family has been living for 90 years, you’re in an entirely different situation,” said Ahmad Fliti, deputy mayor of Arsal. Many returnees who have settled in Arsal can trace their roots back to the border town. The situation in the small town for both refugees and returnees is growing increasingly dire. The swelling population has placed extreme strain on the town’s infrastructure, including its electrical grids, water tanks and trash disposal services. There’s frequent shelling in the area and Syrian Air Force planes regularly fly over the town’s outskirts; kidnappings have also become increasingly common. “Our food packages are critical for Lebanese returnees because the security situation in Arsal means international NGOs don’t have a physical presence there,” said Lebanese for Syrian Refugees’ member Roa Abou Zeid. This was confirmed by UNHCR representative Lisa Khaled who said the agency used to have a bigger presence in the town but, like all other international agencies, they left when shelling over the border became common. While they do still work in Arsal, they are unable to operate in the area when there are evident security concerns. Arsal has not gotten any easier to access. It is a historically Sunni town perceived to be pro-Syrian opposition, surrounded by Shiite towns with largely pro-Hezbollah populations. Lebanese Army checkpoints adorn Arsal’s only access road to the rest of Lebanon. Until very recently, a Hezbollah-operated checkpoint was stationed between the town and the adjacent Shiite-majority Labweh. This has left many within Arsal — refugees, returnees and residents of the town alike — extremely hesitant to travel outside the town. “How are we supposed to get to Beirut? Our lives aren’t secure if we go there,” said Abdullah, a Lebanese returnee waiting in line to receive food packages. “Our lives aren’t even secure if we go to Labweh.” Last summer, returnees living in Arsal had to pass through Labweh to register with IOM and the HRC in larger Bekaa cities; the fear of crossing out of Arsal’s borders prevented many returnees from registering with the NGO. “Even people who are from Arsal don’t leave the town,” Ezzedine said. 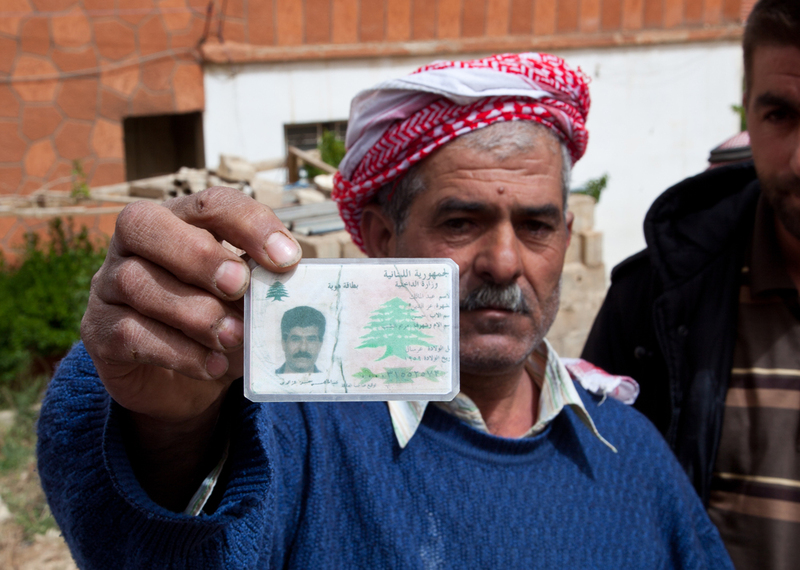 His calloused hands hold up his Lebanese national identification card with a mixture of pride and disdain: he is happy to be Lebanese, he says, but adds that his nationality has complicated his ability to receive aid. According to IOM’s Santucci, Lebanese returnees have the same legal status under Lebanese law as other Lebanese citizens. There is no legal differentiation between a Lebanese who has lived in Beirut since birth and one who was born in Syria, as long as they both have national ID cards. “As Lebanese citizens, it is the Lebanese government’s responsibility, from a legal standpoint, to adopt them and settle them in Lebanon with dignity,” said Nabil Halabi, a human rights lawyer and founder of the Lebanese Institute for Democracy and Human Rights. He added that the Lebanese government should not deal with returnees the same way it has responded to the influx of Syrian and Palestinian refugees. “If the Lebanese government considers Syrian refugees to be guests here, then the Lebanese who fled from the border areas should not be considered guests. These are our citizens.” Both he and Arsal’s Fliti said the onus is on the Ministry of Social Affairs to better assess returnee needs and coordinate aid to them. The ministry itself may finally be making some moves. Ministry representative Hala Helou said the newly formed returnee department in the ministry is now taking on the role of coordinating the government response toward returnees with that of international organizations, much like what it already does for Syrian refugees. The ministerial department has presented a proposal to the Lebanese cabinet on how to structure the department and address the returnee crisis but, expectedly, there are delays in the ministerial approval. “The cabinet is doing its own thing for a few weeks, and when they approve our proposal, we’ll have clear guidelines for how to work,” Helou said. IOM and HRC have been facing their own obstacles. Since the first wave of registrations last year, budget constraints have prevented both from registering and assisting other returnees. According to Fliti, rent assistance that IOM provided to 25 of the 200 Lebanese returnee families in Arsal only lasted two months, and much of the aid the group had been giving to other households in the Bekaa was limited due to a lack of funds. Santucci said that IOM expected to do another round of registration soon, depending on donor funding. HRC itself has been embroiled in corruption charges. Its secretary general, Ibrahim Bashir, was indicted on May 13 on charges of embezzling over $10 million of public funds. Allegations of corruption within HRC are neither new nor uncommon; despite them, and despite HRC’s lack of accessible registration centers for many returnees, Santucci says Lebanese returnees are still seeking registration help from the institution. An HRC representative was unavailable for comment on the commission’s upcoming returnee activities. As donor funding and aid grow increasingly scarce and Syria’s humanitarian situation continues to deteriorate, many returnees are left in limbo. A full 75 percent of those registered told IOM they were unsure when they’d be able to return to Syria, but that they were waiting on “one or several factors” to change before considering a journey back. What has become clear, however, is that many no longer consider Lebanon their home. “We’re from Qusayr. We’ve been there for sixty years, since I got married,” Zaroubi recounts with tears in her eyes. She now lives in tented settlements on Arsal’s outskirts with other Lebanese families. For many returnees, Syria has been their home for decades, and, as soon as it is safe, it will be again.